The Point Arena Lighthouse and Stornetta Public Lands are located along the Mendocino county coast about 3 hours north of San Francisco. The Lighthouse is dramatically perched on a narrow peninsula flanked by 60' cliffs. The Pacific Ocean pounds away relentlessly below. A steady chilly wind blows in threatening to blow my hat out to sea. The fog has pulled back from the coast about half of a mile although a slight haze still hugs the cost line. A group of harbor seals lay out in the sun on a rock just off shore. The colors change intermittently as clouds pass by the sun. One moment a dull gray is cast over the area, as the clouds pass brilliant colors spring to life. The ocean lights up with greens and blues, shades of red emerge along the sea cliffs, purples and yellows stand out in the vegetative ground cover. Just an average spring day on California's North Coast. 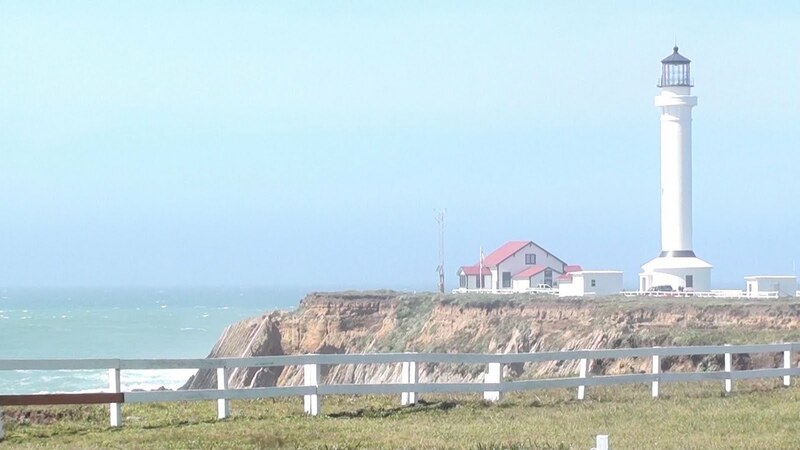 The Point Arena Lighthouse Keepers operate the 115' lighthouse. For a small donation you can make the climb up the spiral stair case to the top. Once at the top you can walk around the lighthouse on an exterior balcony or climb a narrow, almost vertical stair case to the lens room. In the lens room you will have a magnificent 360° view. Looking northeast you will see Manchester State Beach, west jagged rocks protruding into the sea, south southeast the coast line of Stornetta Public lands, and east green rolling coastal hills. You can see all of this without making the climb up the lighthouse although the view from the top will give you an unmatched panoramic view. 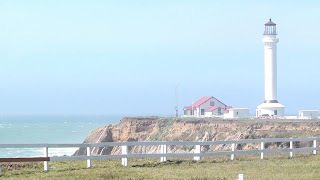 The Point Arena Lighthouse Keepers also operate a small museum and gift shop and on-site lodging. The land outside of the gates of the lighthouse is the Stornetta Public lands.This area has been turned over to the Bureau of Land Management. Currently the BLM is reviewing how best to manage this area but in the interim it is open for hiking although there are no real developed trails. Lighthouse Road is a county road and parking is permitted at any of the road side pull-outs. About one mile from Highway 1 on lighthouse road is a good place to park. From there you can walk south along the bluffs toward Sea Lion Rocks a small island that is sometimes accessible during low tide. I am currently recovering from an injury so I did not get to explore the area as much as i would have liked to. I understand that if you keep walking south past Sea Lion Rocks there is a small stream waterfall into the ocean. I'll have to come back and check that out. About half a mile north of Lighthouse Road on Highway 1 is Miner Hole Road. Miner Hole Road is a dirt road that is very overgrown it is riddled with potholes and ruts, you will need a vehicle with some clearance to drive down it. As you drive down Miner Hole you will see the Garcia River estuary on your right. At the end of the road you can park and make your way down to the river. I came across three men who where in the river fly fishing, it looked like a pretty good spot. The coastal land north of the Garcia River is a mix of BLM, Manchester State Beach and the private land of the Stornetta dairy farm. This map from BLM shows the break down. I didn't make it over to the state beach but I understand there is year round camping available. Other attractions of the state park include beach access, fishing in Brush and Alder creek, a verity of coastal flowers as well as being the northern most point of the San Andreas fault on land. This area is not what most people think of when you say California coast. This area is dramatic, waves pounding the 60' cliffs, jagged rocks, wind and fog. Theses are not the beaches of "Baywatch", its much more beautiful (except for the lack of girls in bikinis). If your driving Highway 1 Pt. Arena Lighthouse and Stornetta Public lands is pretty much a mandatory stop. So check it out, use caution near the cliffs and on the rocks and enjoy.